Do you know a woodworker who deserves to be recognized for going out of their way and doing something extra special for their community? Consider nominating them for the Minwax “Do Good With Wood” Award! 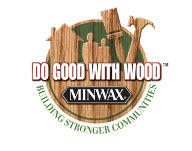 The new Minwax® Do Good With Wood Award will recognize the talent and generosity of a deserving woodworker with an annual award and cash grant, as well as a free supply of Minwax products. For generations, Americans have enjoyed working with wood to improve their lives and those of others, whether they’re refinishing furniture for families in need, creating and finishing wooden toys or crafts to raise money for the PTA or local sports team, or building a wheelchair ramp for a school or bookcases for a library. For the last twenty years, Minwax® has encouraged their efforts with the Community Craftsman Award, which bestowed grants on projects as diverse as an afterschool wood finishing jobs training program and a guild program to design and build beds for handicapped children. Now, Do Good With Wood expands on that program by recognizing the very different ways in which people express themselves by working with wood. In fact, the new award program is open to virtually anyone who has been involved in a wood finishing project, through school woodshop classes, clubs, guilds, parent organizations, DIY groups, craft or hobby groups, or on their own. First Prize: Cash grant of $5,000 plus a workshop with wood finishing expert Bruce Johnson and a supply of products valued at $1,000. Second Prize: Cash grant of $2,000 along with a supply of Minwax® products. Deadline for submissions is December 31, 2012. Good Luck!! !